From time to time here on Spontaneous Lunacy we’re going to inject a few broader topic posts into the mix to ensure that the chronological look back at how rock ‘n’ roll emerged is fully understood. For the most part virtually everything that needs to be covered can be done so quite well within all of the individual record reviews and I want to keep the focus on the that aspect with the blog rather than have this turn into a big-picture history book where there are sprawling dissertations that overwhelm everything else. But every so often there’s something that looms very large in the story that has no specific fit within a single artist’s review, nor will it be able to be shoehorned into the context-setting Monthly Overviews we’re including along with them. So when that happens you’ll see an occasional post under the heading We Interrupt This Broadcast. There won’t be many, just a handful probably over the seventy years and counting that we’ll eventually (he says optimistically) cover in full, but when they DO pop up despite probably not having the intrinsic appeal of a record review to pore over these will be absolutely vital in understanding a lot of the reviews that will follow. Our first such essay deals with something which would drastically impact the entire recording industry in 1948, especially altering rock ‘n’ roll’s progression just as it was starting to get its feet under it and see growing commercial response to what they’d laid out in its first four months of existence. It was the dominant topic throughout music in 1948 and virtually everything that follows over the next 12 months is affected in some way or another by this event. As of midnight January 1, 1948 when the New Year rang in nobody in America was allowed to make records. So said Joe Petrillo, the czar-like head of the musicians union. And this wasn’t the first time he said so either. Back in 1942 Petrillo launched one of the most notorious strikes of the 20th century over a similar issue, arguing that radio play of pre-recorded music was hurting his union members because the rise in popularity of playing records over the air meant the musicians themselves were no longer being employed by stations to play live in the studio. Since its inception in the 1920’s radio had used studio orchestras for playing live music over the air, which was both costly and cumbersome for stations. The logistics of it alone, having a studio with good acoustics that was also large enough to fit a full 18 piece band or so, employing engineers to set up all the microphones perfectly to make sure the sound coming out of the speakers at home was representative of what was being played, and of course PAYING all of those people, right down to the last member of the band who merely tooted a kazoo or chimed finger cymbals. But that’s how they all did it. For at that time it was still largely the SONG itself that captured the public’s fancy, regardless of who was performing it, and it was even considered deceptive to play a pre-recorded song rather than offer a live rendition, almost as if you were trying to dupe the public in a way. But over time as recording technology improved, especially with the advent of magnetic pickups which resulted in a much clearer sound on records, the popularity of home phonographs increased and with that audiences began showing a greater interest in hearing specific artists perform the songs they were associated with from their records. Suddenly it was no longer deemed smart to have an anonymous studio group perform the latest hit by Bing Crosby unless Bing Crosby himself was singing it. Since Crosby couldn’t be making daily appearances at every station around the country, singing the song anew at each stop, stations simply began playing the now familiar record itself over the air thereby eliminating the need for any musicians to be employed by the station at all. Costs were cut, ratings improved, and stations had more control over all aspects of their shows. He railed loud and long against “canned music” as he called it, claiming it would be the end of music and of civilization as we knew it. His complaint was that radio’s adopting this new format would put a ton of musicians out of work who counted on being part of these studio orchestras and thus he demanded higher royalty rates for playing records over the air which was intended to create a new fund to support his union members hurt by the shift to these pre-recorded songs. The hammer he wielded in the negotiations was the following edict: Until the demands were met no union musician would record another note. Thus no “new” records would be made thereby cutting off the very source of radio’s playlists. It was a strong – and effective – strategy. The long and short of it was the strike lasted more than two years, even in defiance of President Franklin Roosevelt’s plea to end it as the President viewed music a vital leisure time distraction from the daily worries of a country immersed in a world war. Petrillo could’ve cared less about the freedom of the world, his only concern for humanity was for those who paid union dues to play a tuba or a glockenspiel. 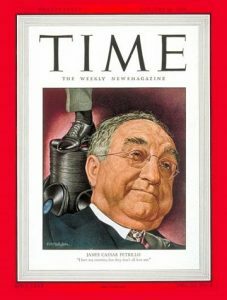 Despite being the most hated man in America with 70% of the public opposed to ban and with pressure applied on him from all corners to yield, Petrillo didn’t budge and in the process it was posited that he had become one of the most powerful men in the country, even on par with Congressmen enacting laws and the Generals fighting overseas to win World War Two. Older records were re-issued as a stopgap solution but the effects of the ban were much more far-reaching and transformative musically than anyone could’ve imagined. 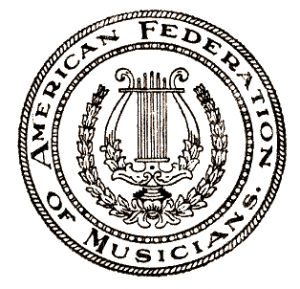 The musicians he was fighting for arguably wound up being hurt the most, as with no new sessions being made record companies shifted their focus away from the big bands that had dominated the scene for two decades and instead focused on the vocalists, who were NOT part of the musicians union and thus not prevented from recording. Prior to this vocalists had only been one small aspect of a band’s appeal, rarely publicized (or paid) on par with the bandleader and most often not even coming in to sing their first verse until at least a third of the song had been played. Now the companies who were desperate for new material cut them singing acappella with only choral backing and as a result there was suddenly a huge new market for crooners, as Frank Sinatra for one saw his popularity soar thanks to this unlikely turn of events, while the importance of the band playing behind the singers diminished greatly. Meanwhile jazz, which had been one of the most popular styles of music for years when the strike hit, saw its latest stylistic excursion – bop – being invented largely under cover of darkness, as with no records made to capture these experiments for public consumption the style failed to find a wide audience. Thus the most advanced music of its time wasn’t able to get its share of the spotlight and after the ban finally ended so too did jazz’s prevalence in mainstream music circles. Eventually the demand for new music began to win out and in the end Petrillo got what he wanted as record companies eventually caved in once their supplies of recordings started running low. When Decca and the newly formed Capitol Records settled with the union in 1943 and subsequently saw their stature – and that of their artists, such as Louis Jordan – rise dramatically thanks to having a steady stream of new records coming out, the writing was on the wall and by late 1944 the remaining holdouts, RCA and Columbia, had no choice but to come on board and the strike mercifully ended. Though it had been a success in some ways it hadn’t changed the inevitable – radio never looked back from their decision to go to pre-recorded material. Yet Petrillo remained convinced, despite grumblings from his own union members, that it was a rousing triumph and so now, five years later, he was at it again trying to secure even better royalty rates for his musicians, particularly as it pertained to playing pre-recorded music over the relatively new outlets of FM radio and television. Ironically the relative success of the previous ban hurt this one’s chances at succeeding. In the interim Congress had passed laws that were widely referred to as anti-Petrillo edicts curtailing the power of unions for making demands when striking. Overestimating his own power the dictatorial blowhard Petrillo promptly announced in June 1947 that his musicians would strike again at the end of the year if these laws were upheld by the courts. Thus he’d given the industry months to prepare for this inevitable outcome and in the weeks leading up to it every record company ran sessions virtually around the clock, cutting as many sides as possible in order to withstand the recording draught that was looming. They’d all been through this before, knew what to do and what not to do in order to ride it out, and since the stakes weren’t as high the support of the union itself wasn’t as strong, particularly with built-up resentment from the last stoppage still on everybody’s mind. While most styles of music were prepared to deal with this, the one that was least ready was rock ‘n’ roll. After all, it had only been unleashed to the world in September and as 1947 crept towards a close the total number of rock releases were still very few and those which had verifiable impact were even fewer. Yes, some DID connect rather quickly, particularly in localized markets. Roy Brown and other New Orleans based artists did very well in the Crescent City and along the gulf coast. The Ravens were selling strong in New York and would be the first to break out nationally, though official recognition for that didn’t come until January of 1948. And already Paul Williams and Earl Bostic’s sax instrumentals were making noise in northern cities. Yet the rock “movement” as it were remained largely underground, mostly undefined and completely uncoordinated. So while ALL labels, including those smaller independent ones most hospitable to rock, were stockpiling masters to wait out the ban, there was one huge difference between the music the rock outlets were trying to get down and the music the major labels specializing in pop and jazz were busily cutting – namely the established styles already knew what sold! Rock-based labels on the other hand had such a slim track record to go on, its audience hadn’t yet even been exposed to all of the various forms on a national level, and even the artists themselves had little feedback from playing this music in live venues to know precisely what worked and what didn’t. Thus their final sessions of the year resulted in a hodge-podge of far-flung experiments, many creative dead ends and with only a few records that were far-sighted in their ideas. This would be both a curse and blessing for rock going forward. The curse obviously was there was a decided lack of new and exciting records in the most appealing style to release over the ensuing months, a crucial time for solidifying the emerging style in the public’s mind, something that – like with bop earlier – might’ve been a death knell for its long term prospects commercially. Yet the unexpected blessing turned out to be the fact that the market itself wasn’t flooded, as needing to conserve their stockpiles companies weren’t releasing as many records overall nor were they releasing what they had as frequently as they had been in the past. As a result each good record had far more time to find an audience and once something did connect that record would remain prominent in stores and jukeboxes for a much longer period of time, thereby boosting the stature of these hits and broadening their influence significantly. The other factor that helped rock considerably was due to its being largely under the radar it allowed the small labels rock artists generally recorded for the ability to stealthily circumvent the strike. During the first ban there were only a few huge labels in existence and thus it was far easier to keep tabs on their activities, yet by 1948 the number of new independent record labels had exploded with most of them specializing in music the majors largely ignored played by musicians who were nowhere near as well-established or financially solvent. Whereas the major companies remained far more scrutinized and thus had little chance to get away with trying to surreptitiously cut sessions under the table with their big name artists, the indies had much less of a problem convincing rock musicians, who also due to their skin color were mostly in segregated local union chapters which were not as well-provided for anyway, to cross the line for cash. By mid-1948, having had time to absorb the new sounds and see which records had the most appeal in this new style, rock artists began slipping into the studio to cut new songs that were far ahead of the stale leftovers the older styles of music were still putting out due to the ban. When late summer rolled around rock was suddenly claiming a greater share of the black music market than likely would’ve been possible if all of the established styles were issuing a steady stream of new recordings as well and by the time the strike was settled in December 1948 rock ‘n’ roll had firmly entrenched itself in the musical landscape where it’s remained ever since. Petrillo’s reign of power largely ended after this, though he held on for another decade as head of the union, but while bringing the music industry to its knees during the two recording bans is what he’s gone down in history for, in many ways it wasn’t the labor wars that became his most lasting legacy, it was the music scene that was upended at two crucial moments in history which caused certain styles to fall from favor and in the process opened the door for rock ‘n’ roll to take over the world. That’s where we find ourselves as the chimes struck midnight on December 31st, ushering in 1948 with silence rather than a bang. Petrillo wasn’t the first to decry “canned music”. A half-century earlier, the legendary John Philip Sousa refused to conduct his band for recordings (the primitive medium of the day was the wax cylinder, packaged for sale to the 1890s public in cardboard cans — hence the disparaging name, “canned music”). Sousa’s Grand Concert Band made many recordings through the decades on cylinders and later on discs, but only rarely did Sousa himself consent to participate. An interesting summary of a complex set of events. A few corrections, though. Someone in charge is a “czar” (not a “tzar” — you may be mixing up “tsar” — a pre-1917 Russian emperor — with the alternate transliteration “czar”). A blog is a legitimate place for opinion, but you seem to be writing from a position of bias against James Petrillo, who was really just doing the job he was hired to do — protecting musicians and their jobs. He couldn’t see the future any better than you can, so even if he was wrong about where things were headed, an objective account wouldn’t refer to a person as “a dictatorial blowhard” or opine that he “could’ve cared less about the freedom of the world” (though you must have meant he “couldn’t have cared less” — right?). I always appreciate a succinct account of facts, though, so despite my small complaints, I’m glad to have found this post. I’m glad you found the post too and am equally glad for your comments. I hope you check out the entire site which explains some of the other issues you brought up in far more detail than I could offer in this limited space. The basic goal of the website is to somehow coherently explain the full twisted story of rock – its musical origins and cultural representation, its terminology and ensuing appropriation, and obviously the focal point of all this, which is to provide a detailed examination of how the music itself evolved by chronologically reviewing as many records as possible. As for Petrillo I actually have no bias against him, in fact I’m glad for his actions because they led, directly and indirectly, to the music world we live in today. My somewhat mocking tone regarding his persona is just hyperbole to keep the mood light for a topic I was worried might be too detailed oriented for readers to plow through, especially since it lacks any musical analysis which forms the primary feature of the regular posts. But that just shows what I know because this has been one of the most consistently popular pages on the site, ranking in the top five views each month since it was posted. Considering that it was a last minute decision to even include this page to explore a topic I knew was going to be referred to constantly in the 1948 record reviews I guess it was a good decision. You’re never really sure what draws people to a site initially, if they’re looking for something specific or just happen to randomly stumble upon something here, but I’m a bit surprised that this page in particular seems to be an entry point for many in discovering the site. So welcome to Spontaneous Lunacy, I hope you stick around and don’t hold my occasionally sloppy proofreading against me. That’s one of the ads included on these pages for the review of Paul Gayten’s Backtrackin’ (Dr. Daddy-O) which was posted in June, 2017. Glad to see someone else had brought it to people’s attention as well. It’s actually just one of many examples scattered throughout the reviews here showing the term “rock ‘n’ roll” was being used to describe the music in the black community from the very start back in 1947. Unfortunately because there hasn’t been nearly the attention paid by historians to African-American sources however, and because a lot of the black newspapers and handbills from that period haven’t been archived properly, it does take some digging to find them, but as you showed it CAN be done as long as people are willing to look. Leave a reply on "WE INTERRUPT THIS BROADCAST TO BRING YOU: The 1948 Recording Ban"